LDES provided all surveying, civil inspection and construction management services for this $30 Million dollar project. 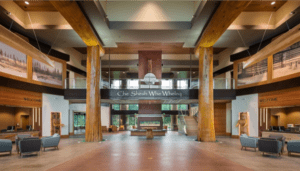 This 120,000 square foot administration building is expected to centralize tribal services and has been highly anticipated project for the Lummi Nation community. 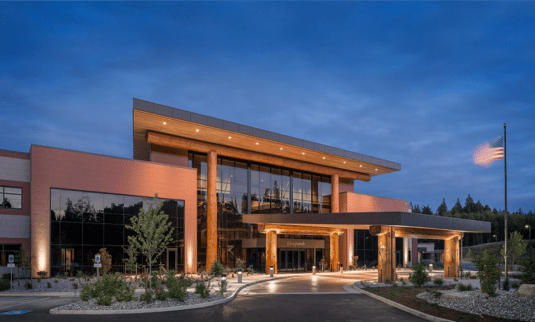 LDES’s construction management team collaborated with the Lummi Nation from the design phase providing value engineering, selection of and contract negotiation with the general contractor, as well as ongoing oversight of construction, inspection and document control for this project. By providing value engineering, LDES was able to reduce the construction cost. This included suggesting different use of building materials and building layout, changing the layout of underground utilities, landscaping contracts, modifying the HVAC system, and using on-site suitable native material for site work to reduce the amount of import/export material. All these modifications to the design and construction phase saved the Tribe approximately $5 million dollars.